Here is another quick & easy (no stamping!) card using the Delightfully Detailed Designer Series Paper. This time, I took my sponge brayer and inked the leaf pattern piece of the DSP with Min Macaron ink. 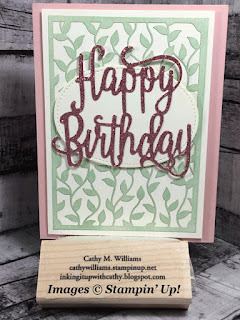 I finished it with the largest Stitched Oval cut from Very Vanilla card stock and the Happy Birthday die cut from the new Rose Glimmer Paper. I love the changes to the glimmer paper - it is so much easier to cut with the dies! Again, I used the liquid glue/water combination on my Silicone Craft mat to apply adhesive to the back of the Designer Series Paper.